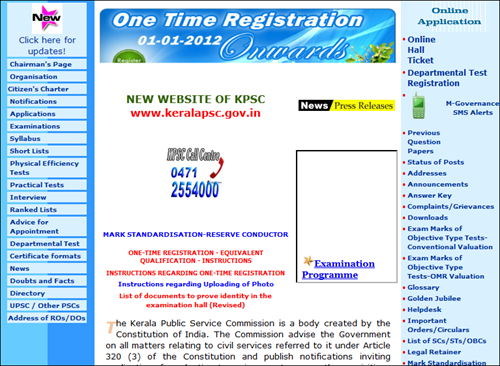 Kerala PSC LD Clerk (LDC) 2013 application notification will be published in June. The Kerala PSC meeting which was held in Trivandrum decided & sanctioned the LD Clerk (LDC) 2013 notification. Along with the notification, the LDC examination time table & venue details are also added. As the validity of the current LDC rank list will be end on 31st March 2015, PSC jas decided to create a new rank list before the speculated time limit. As per instruction candidates have to complete the one time registration before applying for the post. Among the 56,706 candidates who were included in the rank list, only less than 4000 got appointment. It is known that the Kerala Public Service Commission aims to publish the new LDC Notification before June 30, 2013. Then question paper will be in Malayalam. The publication of the rank list would be made possible on or before 31st March 2015. As it would be a direct appointment, the pay scale would be Rs: - 5250-8390/- (PR). For those who wish to apply for the post should have completed 18 (Eighteen) years and should not have completed 36 (Thirty Five) years of age. The one time registration system should be done through the Official Website of Kerala Public Service Commission for applying for the post. Registered candidates can apply by logging in to their profile using their User- ID and password. For applying for the post candidates must exclusively click on the 'Apply Now' button of the respective posts in the Notification link. With no application fee required for the post, candidates can view and have a print-out of the details in the profile by clicking the link Registration Card. Before applying for a post, candidates must ensure accuracy of the information in their profile. Once submitted, the application cannot be deleted or altered. Those applications which are submitted not according to the give conditions will be rejected.